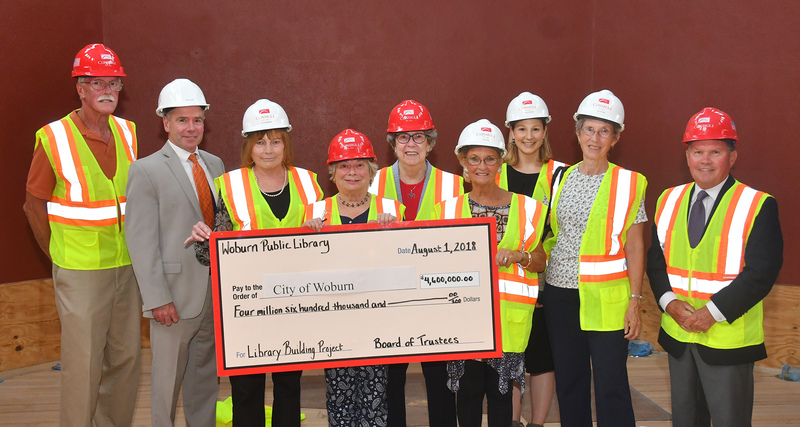 On August 1, 2018, the Woburn Public Library’s Board of Trustees presented Mayor Scott Galvin with a check for $4.6 million to fund the historic library building project. Through careful investment of the magnanimous $1.9 million endowment given by the John E. Frizzell estate in 1987, the Trustees have yielded $3 million of interest to support the historic renovation of the Richardson building. The remaining $1.6 million comes from decades of generous donations from community members for the renovation work and the addition’s construction. In addition to the Trustees’ $4.6 million contribution, Mayor Galvin has executed a legal document with the Trustees for another $2 million from the Frizzell bequest to be paid in annual installments of $80,000 for twenty-five years beginning in 2019. The generosity of Woburnites near and far as well as the shepherding of these funds by the Trustees played an integral role in securing approval for the project in September of 2015. Despite having first identified needing space for children’s services in June of 1900, the Woburn Public Library’s Trustees and Staff began investigating the feasibility of expanding the library in April of 1962 with the commissioning of the Shaffer Report. Throughout the 1960s and 1970s, several attempts to secure local funding for an addition failed. In the mid-1980s, the Commonwealth set aside funding for a public library construction program (MPLCP) to be administered by the Massachusetts Board of Library Commissioners. Throughout the 1990s and 2000s, Director Emerita Kathleen O’Doherty, Woburn Public Library Staff, and the Board of Trustees submitted a total of four applications to the MPLCP. The final application for the 2010 grant round resulted in a $9.9 million grant award from the Massachusetts Board of Library Commissioners. The Trustees and the Woburn Public Library Foundation also applied for and secured a $525,000 matching grant for funds already raised. This matching grant has been provided by the Massachusetts Cultural Facilities Fund, a program of the Commonwealth of Massachusetts, administered through a collaborative arrangement between MassDevelopment and the Mass Cultural Council. To date, $316,500 of the matching grant has been disbursed. The accessible renovated and expanded library will open in March of 2019. The architectural firm CBT, the owner’s project management firm Design Technique, Inc., and the construction management firm Consigli have been working in concert to carefully restore the Richardson and build an addition that complements our National Historic Landmark. Some of the features of the restoration include original paint colors on the repaired plaster walls, refinished original hardwoods, and the return of the original display cases with collections from the Archives to the octagon room, now known as the Historic Artifacts Conference Room, which seats up to 49. In the addition, the features include a spacious Children’s Library with Storytime and Craft Room, a 100-seat Program Room, a Teen Room, three Study Rooms, a publicly accessible Archives Reading Room, and a Maker Space with 3-D printers. Mobile technology will be available to use throughout the library. With the Richardson’s rooms returning to their 1879 splendor and the expansion offering space for 21st century endeavors, there will be something for all of Woburn’s residents, businesses, and visitors to discover, explore, and enjoy. While construction is over 50% complete, the Woburn Public Library Foundation continues to fundraise for much-needed furniture, fixtures, and equipment. Donations of all amounts are welcomed. Those of $500 or greater will be recognized in the library. To learn more about special Naming Opportunities and other ways to donate and help the Foundation reach their goal of $4 million, please visit www.thewplfoundation.com.